Welfare program | Company Introduction | TAIYO KIKAI LTD.
We introduce some activities for the employee's leisure practical use. In the company, all of employees are in a get-together union. The union holds lot of activities independently from the firm. Like every year welcome bowling contest for new entry-levels, travels, graduation parties, that supplying the spaces for employees to socialize. There are softball, golf, photograph, fishing clubs in the unit. The employees, their families, related companies are allowed to use the corporation owned resort facilities. And every 5 years the company organizes the trip abroad, We have been to Taiwan, Hawaii, Singapore, Hongkong, USA, Shanghai until now. We plan to go substantial [ of one layer of nearby welfare program ] as much as possible from now on. 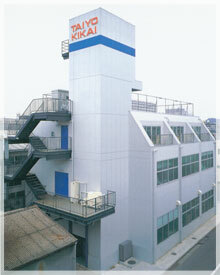 A dormitory for single employees is next to a corporate headquarter building. A free and homely atmosphere is popular.